Give your children their own furniture and they will enjoy at their own place! They can read, eat snacks, watch TV on their own furniture with much entertainment to spare the leisure time. Ideal for any children's bedroom or playroom! This chair is designed with the ROCKING Function, which offers your children a more relaxing feeling when sin on. They can slight rock it comfortably. Soft sponge at the thickness of 1" contained also adds a sense of coziness! 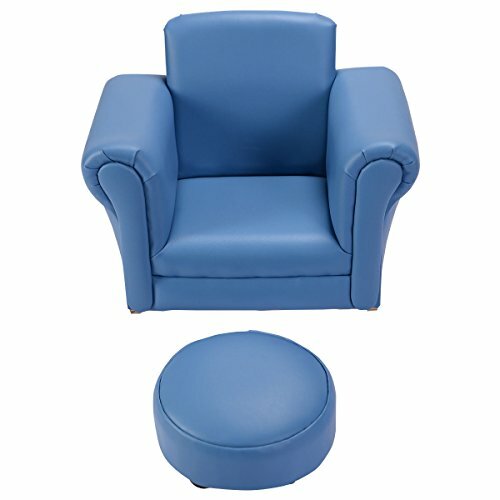 Footstool dimension: 6.6"x6.6"x4.7 " (LxWxD) "
Constructed by sturdy wooden frame, filled by 30D new sponge, cover by PU, this blue chair with footstool is durable for your lovely children. They can read, eat snacks, watch TV on their own furniture with much entertainment to spare the leisure time. Rocker Chair - This chair is designed with the ROCKING Function, which offers your children a more relaxing feeling when sin on. They can slight rock it comfortably. Soft sponge at the thickness of 1" contained also adds a sense of coziness! Lightweight design for easy movement. Your children can move their own furniture to any ideal place without much efforts, which cultivates their manipulative ability. Sofa Dimension: 21"x15"x16" (LxWxD), Seat Dimension: 11.7"x11.7"x7 " (WxDxH), Footstool Dimension: 6.6"x6.6"x4.7 " (LxWxD), Suitable for ages: 1-5 years old. Please check carefully about the SIZE before purchase.